I tend to think the Miata is pretty much perfect. Ok, in stock form, I'll admit that it might not be the most capable tow vehicle of all time. Good thing there's a simple fix for it, and it only requires two V8 engines. 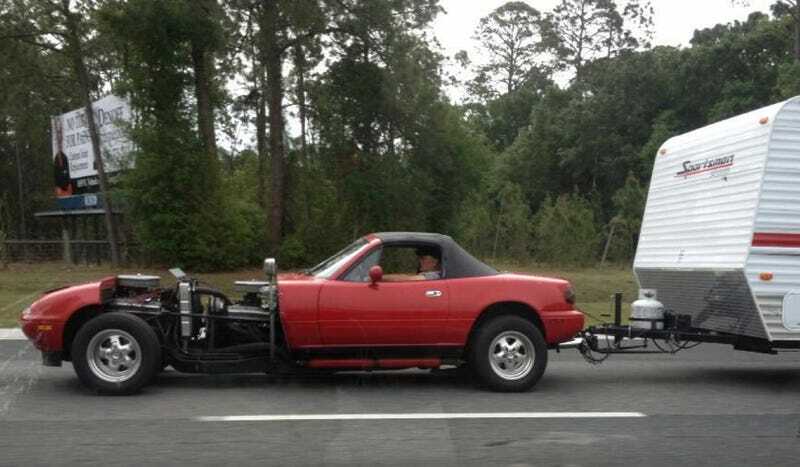 We have seen this Miata before. It was ridiculous then, and it's still ridiculous now. But at least now it's being used for something. And that something isn't drag racing or pulling out moderately sized stumps. Nope. Redditors spotted it towing a mobile home, or a caravan, as some of you might call it. First off, I'm amazed that it's still running. Second, I'm glad to see it out on the road. And third, I'm glad to see all that power is being put to good use and not wasted.